Join us for our Holiday Mixer! When: Wednesday, December 13, 2017, 6:30 pm until the party stops! Theme: Ugly sweater party! Please RSVP so we know how many are coming! 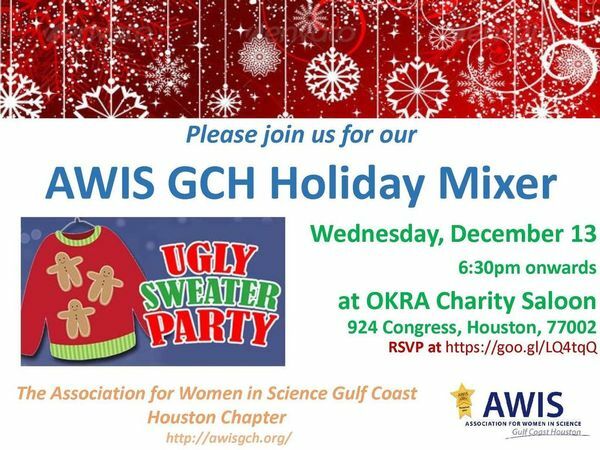 Come celebrate the holidays with AWIS GCH representatives and tell us what you’d like to see from AWIS GCH in the New Year! Previous post ← Outstanding Women in Science Seminar Series Present Dr. Alicia DH Monroe!